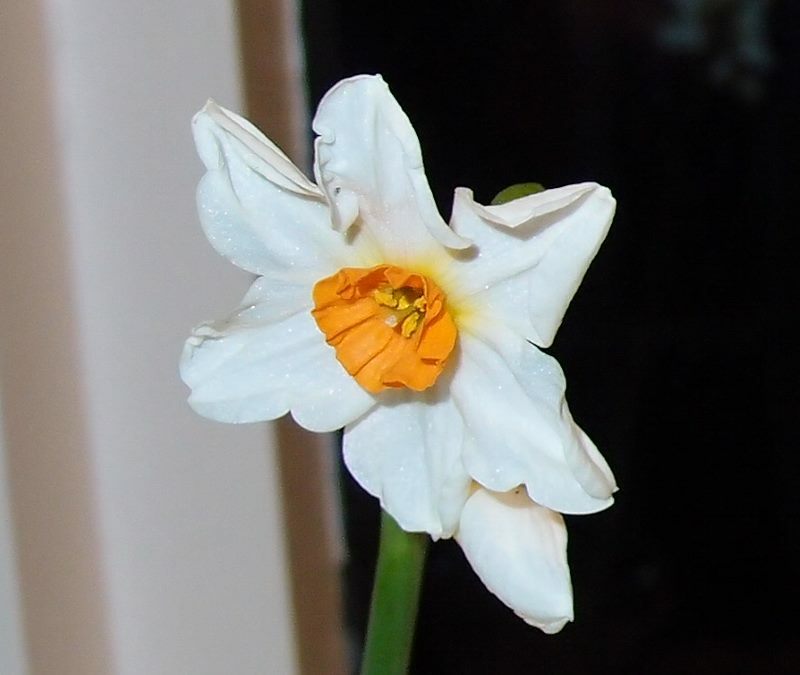 Yes, I do have a photo of a daffodil flowering in January. Cut from the garden on 31 December 2015, and pictured here in bloom in its vase. Narcissus ‘Cragford’ I think. I’ve known roses to be in bloom in early January, if the winter has been mild, as they flower on the end of the growth made over the year. But daffodils in late December/early January is something I don’t recall seeing before in all the years of gardening here. There are a few flowers on the Akebia quinata too (photo of that plant on the old website pages on this link). Really not sure about this. Climate change? 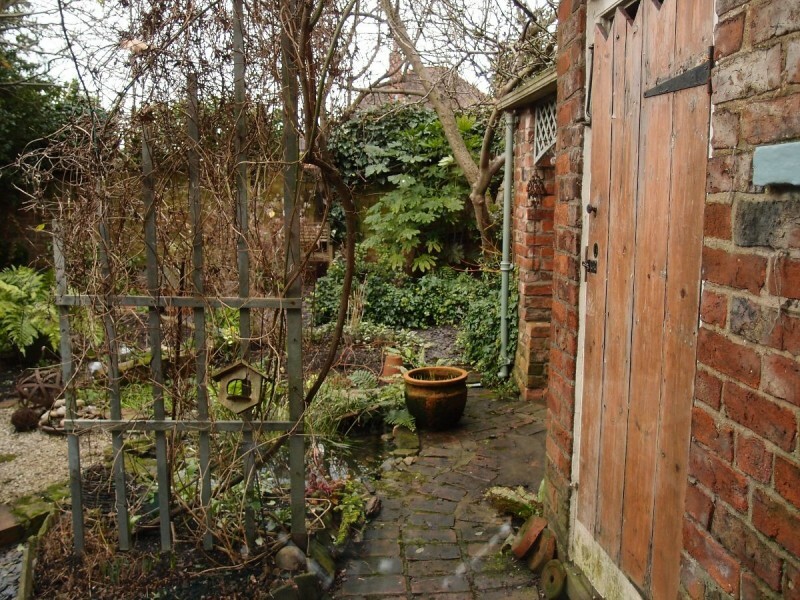 The rest of the garden looks reassuringly brown/green and rather small and pinched and dull and resting, as it usually does at this time of the year. Here’s a photo taken from one of the kitchen windows. I have been out to tidy up a bit, but not much. Did a few hours one afternoon on a mild day, and the next day had that aching thing reminding me of muscles I forgot I had and probably haven’t used much since last time I was out in the garden reaching and pruning and wobbling about on a plank in the middle of a flowerbed. So very pleased to see you are back! I too, kept turning-earth on Favourites and then in the Bookmark list when we changed our machine. Loved the garden view photos and all the wildlife. Checked in every so often to check and today, here you are! We are in a different home and garden now and have been finding what will and won’t grow in clay. Your space looks good and interesting in winter: I like the quiet time. Al the best. Kate. Missed you and glad to see you posting again! Thank you! You’ve been an inspiration. Thank you Kate and Lisa, means a lot to me to read your comments. Just added a brief update, will try to post more often as the springtime encourages me out into the garden more often. Nice to see you back Lisa. Will check in regularly. I started from scratch what I hoped to be a wildlife garden four and a half years ago. Now I have sparrows, starlings and blackbirds nest building, frogs in the pond and hedgehogs just emerged from the woodpile. I know only to well that achy feeling in the back, and the wariness of that hedera – but without ivy I couldn’t have anything substantial enough to offer suitable nesting sites. Lovely to read that your wildlife garden is doing so well Carolyn, sounds like you have more creatures than I do – never had any hedgehogs, wondering whether to make a hedgehog-sized hole in one of the walls … And yes, ivy has provided a nesting site year after year for blackbirds and dunnocks in this garden, and is so valuable as reliable cover for nesting and roosting.